It's been fun to see the new houses go up in our neighborhood since we moved in -- this is pretty much a dream come true for me. I love visiting home tours and model homes so being able to peek inside the new homes has been so fun! As I look at them I realize that there are certain things I've done that set our house apart from the others (on the inside) and most of these projects don't cost much at all. 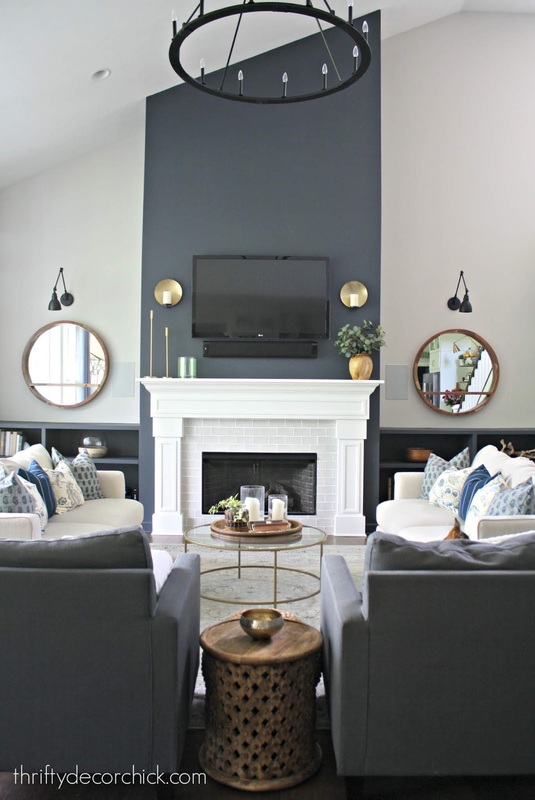 You can definitely have a unique home whether you live in a custom or a "builder" home (I hate that term but not sure what else to call it) -- it's just about adding personal touches. These are a few of the things I've done in both houses that really set ours apart from the rest. I still laugh because everyone said I wouldn't have much to do in a brand new house, but this stuff is what I LOVE working on...adding character and personality to our new home. You can find all the details about that paint job here. This room was beautiful before we ever put a thing in here, but the paint just made it feel more like "us." Of course the DIY built ins helped too, and I'll talk more about that in a minute! Check out this painting doors tutorial before you attempt it (or the paint may peel right off!). 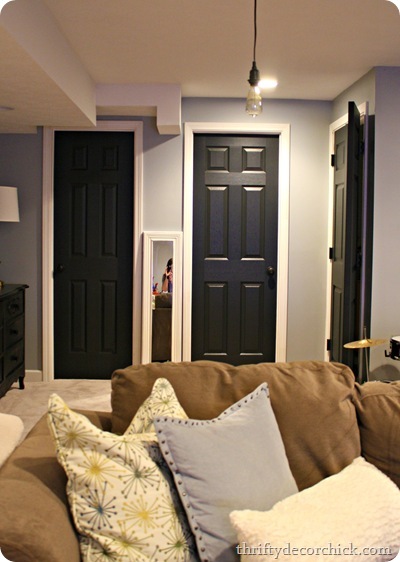 I didn't have our builder paint the doors in this house to save money, and I just wasn't sure I'd want them dark in this house. After living here for this long I'm starting to miss the black so I'm starting with one to see how I like it. :) I just love our five panel design and I know it will be so sharp! It's just strips of wood I had cut down at Lowe's and then stained. Easy to do and BIG impact. And how many people have big stained walls? Not many. 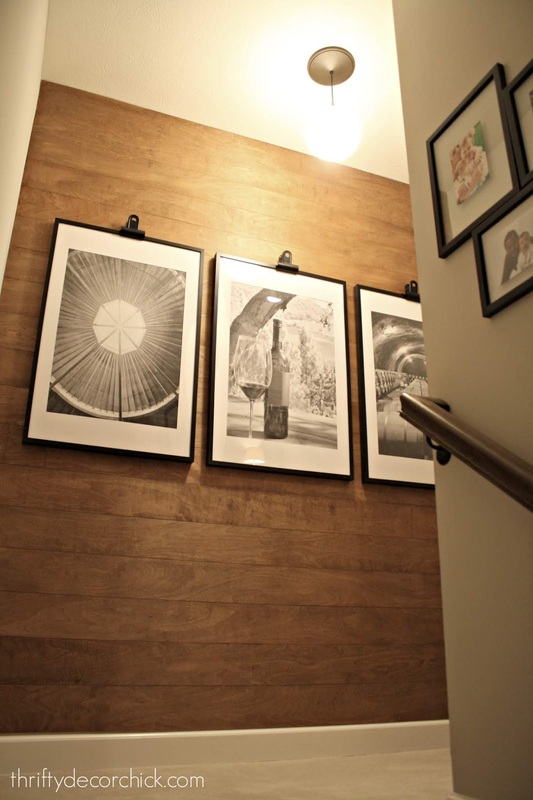 ;) I love doing something like this on staircases because they are a perfect size and location for something dramatic. Some of my favorite projects ever are like this -- when someone walks in and notices something is different but can't put their finger on it. It's a subtle change that still makes an impression. 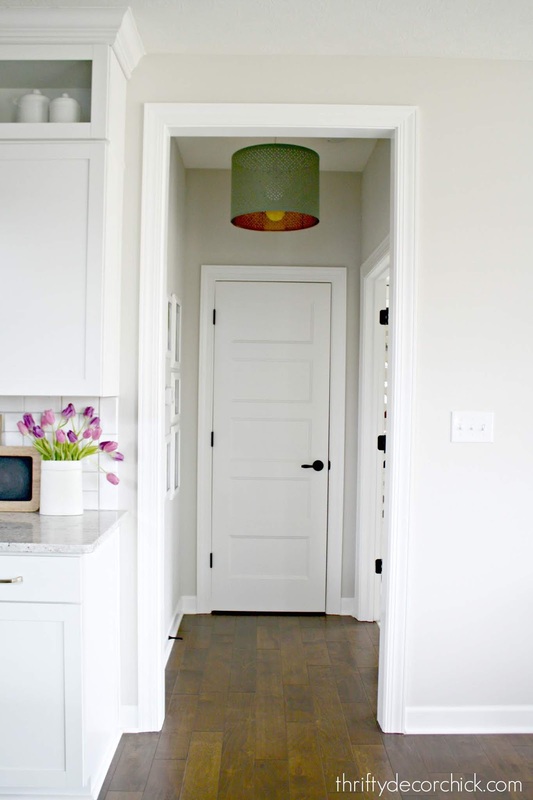 You can see how to easily convert a recessed light into a hanging one here. 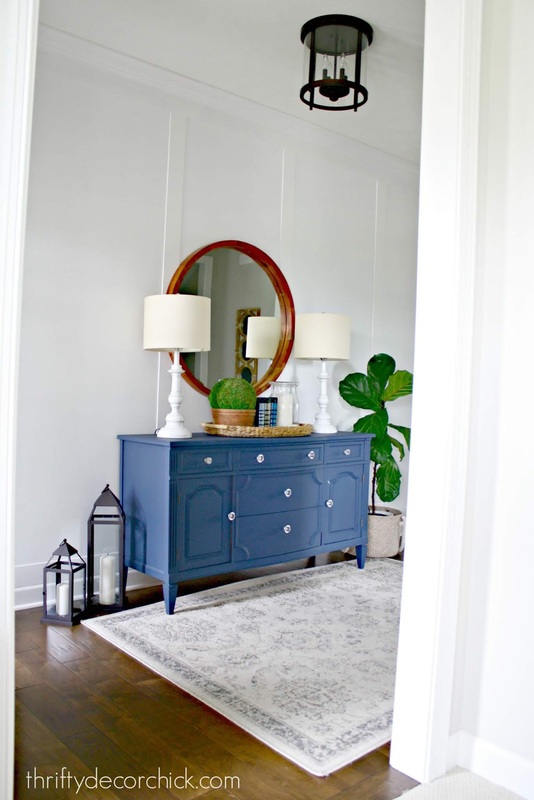 I have at least one more spot I plan to do this -- I love drum shades but I love when I've seen baskets transformed into a light too! 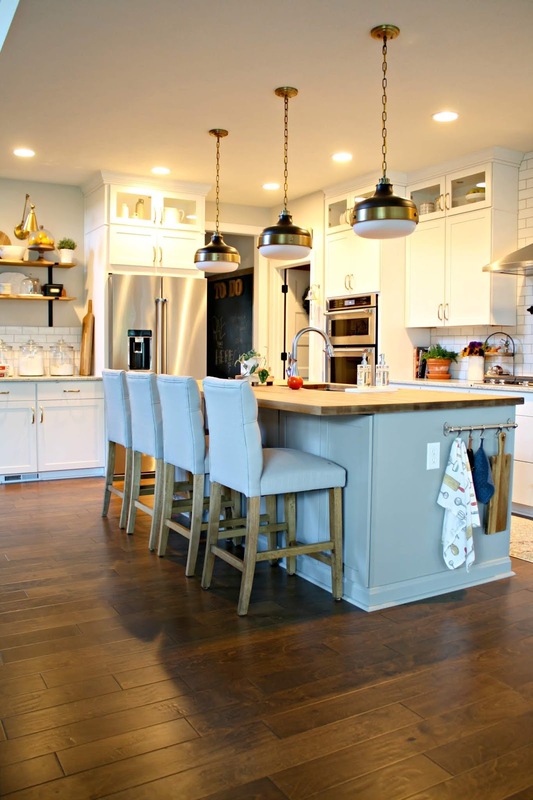 I love clean and bright kitchens, but I always crave that warmth that wood brings. This one was the same if not less than what our stone counter would've cost. I've found IKEA is the best option for butcher block (in smaller pieces). You can also see more about the long piece I used on our last extended island here. Add to that the wood shelves I installed instead of an upper cabinet and you have more detail and character that wouldn't be there otherwise. Of course if you're building you can have the builder do some of these projects! But I've found pretty much every time it's way less to tackle them on your own. I think each of these is a way to set your home apart from the rest, no matter the size or cost of your house! Thanks for the specifics on ideas that set your home apart. I have small things in mind to make mine feel the same. Will keep following you for more ideas. Your ideas are always so inspiring. I love what you have done with this home and your previous home. That wood wall going down to the basement really has me thinking... We keep having to repaint our wall because of fingerprints. I will have to look at your tutorial to see if it's something I would want to take on! Love all of these ideas. We have been in our home for 26 years now, and ready for some much needed updates to take our 90s home into the 2000s. I love a simple DIY that has big impact. 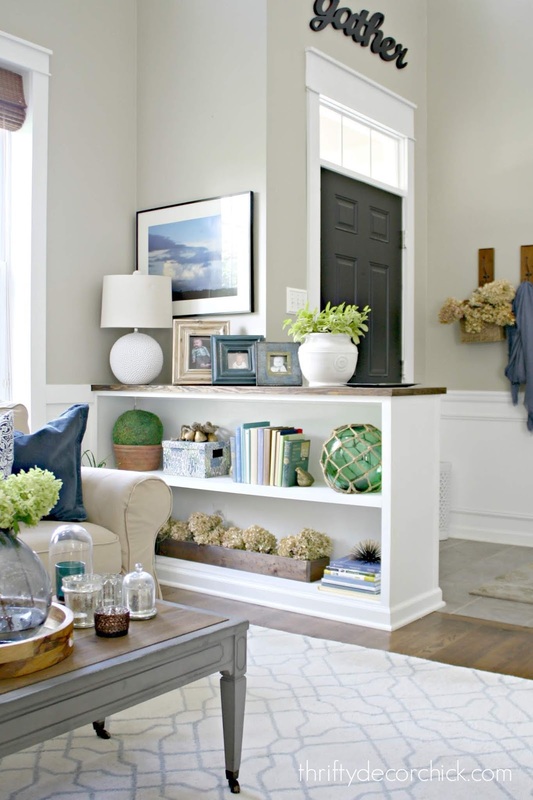 Yes, these are all great and relatively simple customizations that seriously elevate your home! We moved recently into an 80's home with a few excellent details (black steel windows, solid wood exterior doors) but literally the cheapest light fixtures, doorknobs, and no architectural features. We've already added built ins and I'm slowly working on replacing light fixtures. There's a book nook that I want to do an accent wall in (still dithering on medium paint, dark paint, or stained wood planking :-P ) and the borrrring dark long hallway definitely needs some sort of painted paneling. I'm going to paint the interior of the French doors black and add wooden shelves next to the kitchen sink. Seems like we are on the same page with this sort of thing!